Ruth, a Catholic homeschooling mom I know online, has a business making rosaries. During the months of September and October, proceeds from the sale of her rosaries is going to the Bryce Mitchell Memorial Fund. Bryce is the son of another Catholic homeschooling mom, and his sweet life was cut short after only a few months. I ordered this rosary from Ruth and it arrived today. 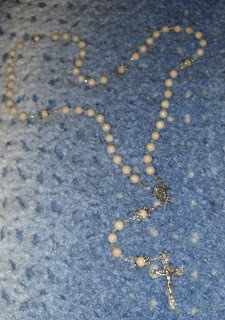 The picture does not show you how smooth the stones are, or the heft of this rosary. I like the way it feels in my hands very much -- and I'm so picky about the rosaries I like to use that I was a bit worried about ordering online. I had nothing to worry about! I especially liked the fittings that surround the Our Father beads, as I often say the rosary in the dark and need to feel the change from the Hail Mary beads to the Our Father beads. If you're in the market for a new rosary, please head over and look at the beautiful rosaries she has created. I know you will be pleased! As an aside, the rosary is placed upon a prayer shawl that a very sweet woman made for me years ago. It was a precious gift to receive from someone I met only online, and I cherish it.